The other day I was chatting to MamaZombie Mumbles and she had this brilliant idea to ‘redo’ or recreate some of her earlier designs and ideas. She asked me if I wanted to join and of course I said heck yeah! Don’t you think it’s a brilliant idea? I am too embarrassed to link back to the actual post ( I will say it was 2012 😛 ) but here is the (really bad) original picture. I don’t even remember which polishes I used but I know it was more than likely mostly Essence. Not long after this I ended up getting rid of the glitter I used on my ring finger and I so regret it now. It was one of the old Essence colour & go polishes. Anyway, want to see how I redid it? I started with 2 coats of Sinful Colors – Snow me white on all my nails except my ring and thumb. I used 2 coats of Sinful Colors – Blue by you on my ring and thumb and then left that to dry completely. 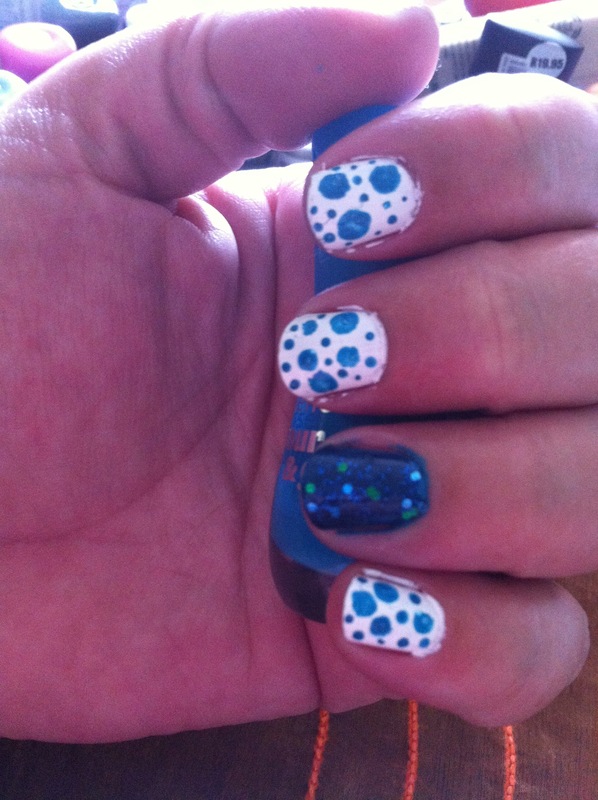 Once it was dry I used dotting tools in various sizes and Sinful Colors – Blue by you to make dots on the white. 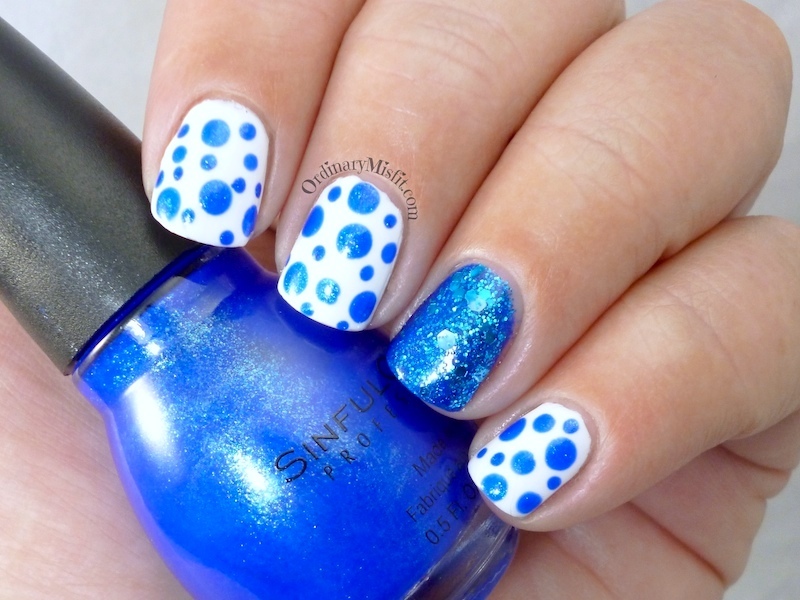 I then added 1 coat of Sinful Colors – After party on top of Blue by you to add the glitter part. I am still not sure if it was necessary but it is super pretty. Top coated and done. What do you think? Improvement? Should I have left it alone? Should I have added something else? Pop on over to MamaZombie Mumbles and see how she recreates old favourites. MeganTS recently posted…It’s Throwback Thursday!